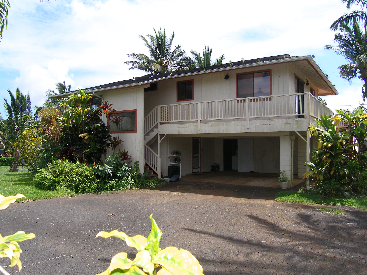 A short sale on this three bedroom/three bathroom home with views of Mt. Waialeale. This two-story home has 1104 square feet of living space on the main level and an additional 624 on the lower level for a total of 1728 sq f. Plus a large upper deck of 256 sq ft. The upper level has 3 bedrooms and 2 baths. The lower level has an additional full bath. Two car garage and laundry room. Tile floors in the main living area. Enjoy the feeling of spaciousness on this 10,262 square foot lot. The property is landscaped with many mature flowering and fruit plants.